10-Man Brawl (battle against 10 enemies). 100-Man Brawl (battle against 100 enemies). 3-Minute Brawl (try to survive for 3 minutes). 15-Minute Brawl (try to survive for 15 minutes). Endless Brawl (battle against unlimited enemies until you quit or you are defeated). Cruel Brawl (battle against very difficult enemies). 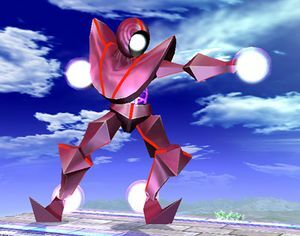 The Red Alloy: similar to Captain Falcon. The Blue Alloy: similar to Zelda. The Yellow Alloy: similar to Mario. The Green Alloy: similar to Kirby. Also, sometimes a normal playable character will show up. One is randomly thrown in with every 25 alloys. In 10-Man Brawl and 100-Man Brawl, the final enemy will be a copy of your own character. Note that these are more efficient and durable fighters than the alloys, but they're still cannon fodder. Just be careful about items, because unlike alloys, the players can use them. Hint: You don't actually need to KO them; they just need to fall off the stage in order for it to count, be it friendly fire from another CPU or just the odd occurrence of them jumping off the stage. You can improve your chances of getting a time trophy if you stand in the middle of the upper platform with Pikachu, and simply spam his Thunder attack ( ). This challenge doesn't seem very hard at first because all the enemies can be killed with a well-placed smash, but once you get to less than 25 alloys left, it becomes a real challenge. 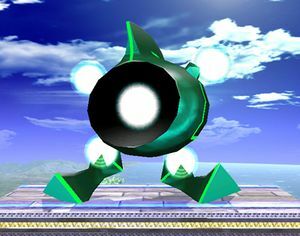 The beam sword is a very effective item in 100-Man Brawl because of its long range and powerful smash attack. Pokéballs and Assist Trophies can also be very useful, unless you get a Pokémon like Goldeen, or Assist Trophies like Nintendogs or Resetti. Fans are also excellent weapons, but work better when thrown. 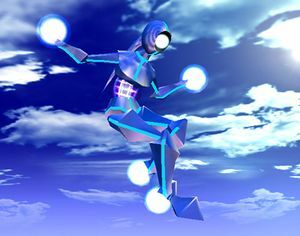 Enemies pop straight up into the air, even if it's the last 25; stand under the left or right platform and throw it straight up, then watch as the Alloys fly off-screen the second they step off their platforms. Another very good item to use is the bumper: stand below the right or left platform and throw it straight up, and it will get stuck right where alloys spawn, creating instant kills very easily. The star rod can be almost as good as the fan when thrown. A ray gun can make a kill with each shot with a little luck, being that it has good knockback. The super scope isn't very good, but a slightly charged shot is enough to take out most Alloys. Watch out for bombs, they have a nasty habit of spawning right next to you when you attack. get rid of bob-ombs before they can blow up on you, or just avoid them until they blow up on their own. Motion sensor bombs should only be used if you can remember where you put them. Smart bombs can take out all five alloys at once, but don't get caught in the blast radius yourself! Gooey bombs are useful, but make sure you can escape once you stick it to someone. The screw attack power-up is also very useful, and can be used to take out multiple Alloys with a single jump. Beating this with every character yields a Blue Alloy trophy; there are also prizes for beating it in less than four minutes and less than three minutes and thirty seconds. If you have a steady thumb and a lot of time, then pick up a fan you get in combat, and minimize the amount of alloys on the screen to either 1, 2 or 3. Use a Fan on the alloys and just keep tapping it. They will rotate around you and will be motionless. If you use two Lucario's, you set up your characters to charge their shot ( ) in a way that juggles the enemy for extremely long periods of time. Simply have one Lucario charge up its energy, then have the other move on top of him but face the other direction and charge up its energy. The crossing paths will juggle the enemies between the two directions. You'll still need to watch the game in case bomb-ombs appear, but you shouldn't have to do much other work than reset the dual charge stance if you happen to kill the alloys. If you use Mr. Game&Watch, you can use his powerful down smash attack to cover you left to right. If an opponent is above you, use the up smash to K.O. it before it lands (I prefer the Game Cube controller for easier executed smash attacks). Using Pit in this is one of the easiest ways to win, simply fly above the other characters until the time is up. Even PK Fire and PK thunder is useful for knocking out the Multi-Man foes. Use + , or + , and + to KO the Multi-Man foes easily. As the match starts, run over to an edge and double jump. While in mid air, use the reflector constantly until you're at the point that you can use the Fire Fox to recover. Then repeat the process. 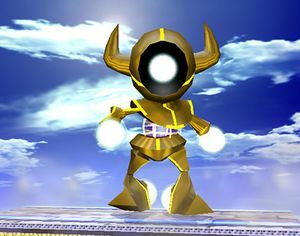 If you don't care about how many KOs you score, simply play as Meta Knight and hold down to perform a standard attack repeatedly. The Alloys will hit you occasionally, but as long as no explosives spawn next to you, you should survive for 15 minutes taking around 100% damage and killing around 25 alloys. If any non-alloy characters appear, stop attacking and kill them prevent or to stop them from using items on you. If you don't feel like fighting or feel like doing minimal fighting, just use Sheik's unique agility to jump back and forth between the two left and right platforms. It's sometimes better to make sure that you land on the inside edge of those platforms, but it works either way. Just try to avoid from having the alloys group up on you and you should be fine. If they do end up getting you, just use a good smash to get rid of them. Avoid Bomb-ombs as much as possible and pick up swords, fans, etc. whenever possible. It's your choice to use them but since the alloys get tougher the more you kill them, it's preferable not to. Throw any other bombs off stage and if a normal character does turn up, just get rid of them and all items on stage as fast as possible. Just wait it out while keeping your jumping between the platforms up and you'll make it through the 15 minutes with ease. TIP: It's better to do this as a single player, since having more than one person usually raises your chances of someone getting hit. WARNING: It can get REALLY boring so if your impatient to this sort of method then it's not recommended. 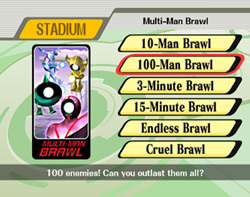 The Cruel Brawl is by far the hardest challenge mode—it combines endless brawl with insanely tough enemies that have the ability to kill you in just a few hits. Their normal strikes knock players back like a smash attack, and an actual smash will be your demise. If you think that's the least of your worries, cruel brawl is just like the other multi-man brawl modes in that you'll be facing three to five enemies at any given time, each with enhanced strength. Every Cruel Brawl session will begin with four enemies on screen, one Alloy of each color. Also, there are no Items to help you. Trophy: KO five enemies with one character. Sticker: KO ten enemies with one character. The following are strategies that can be used to dominate cruel brawl. The easiest way to take on the Cruel Brawl is to avoid fighting altogether. Using Pit you can cause the CPU players to jump off of the stage in a manner that disables them from returning to it, thus giving you a KO. To do this, at the start of the round run and jump off either side of the stage. In mid-air, jump out horizontally far enough so that you can't be hit by any enemies standing on the edge. As you fall, curve in towards the edge, and when you are close to the bottom (you'll need to practice to find out how much room it requires) use Pit's + + + + to keep him alive. Simply fly back up to the edge and grab on. The trick here is to stay airborne for the entire fight — only landing to give Pit another round of multiple jumps and access to his + + + + technique. While doing this, watch how the computer players react. They'll either sit on the edge, jump out into mid-air and back onto the stage, jump down after you and attack, or jump down and then try to get back to the stage safely. If you can cause the Alloys to jump after you while using the normal multiple jumps that Pit has and then trigger his + + + + and fly behind them (towards the stage bottom and back up to the edge), you'll cause the AI to ignore you and focus on survival. If you did it correctly, some of the Alloys will end up being turned away from the stage and too low to recover. When you start doing this well, you'll be grabbing groups of two or more alloys on each attempt. Note that you can also use different flight paths — such as flying over the top of the stage or underneath it, however both take practice and are much more difficult and risky (above you chance falling on the stage, below you chance knocking yourself out). As soon as the battle begins, have Kirby run to either side of the screen and jump into the air. Keep him out of harm's way, and float him to the top of the screen. When he is directly over a group of alloys, use his + + + + attack to transform into something heavy and crush the alloys. From this transformation, immediately press + + + + to perform his sword attack. From here, you may either jump back into the air and repeat the process, or perform + + + + continuously. If you are attacked and knocked back into the air, recover if possible and fly back above them to perform another + + + + } attack. None of these attacks will immediately kill the alloys, but they should allow Kirby to damage and weaken each of them without giving them much chance to retaliate. You can increase the effectiveness of this attack by intentionally dropping Kirby just off the side of the main platform, and performing the + + + + attack to grab the ledge and recover, but this take more accurate timing to perform. Once you start Cruel Brawl, run to either edge and jump off. Fall down and double jump, keeping in range of the platform edge; use Lucas' + + + + to shoot right into the group of Alloys converging at the edge. After blasting them away, climb back up and and repeat the sequence, avoiding any enemies that come close. You may want to run for the opposite edge. Although a very risky strategy, it can keep you alive longer than normal if you can continue to pull the trick off. Ness can also use this strategy, but if his + + + + runs into an Alloy he'll stop, thus dropping him to his doom. This is similar to Pit's strategy. You first jump out beyond the edge of Battlefield, and then curve inwards until you are below the battlefield's main platform. Then, use Neutral B to repeatedly slam into the platform, and remain where you are. The alloys are likely to follow you down and then get Ko'd. Once you start Cruel Brawl, run towards the side and grab on to one of the edges. Wait for the alloys to come near the edge, then use your ledge attack. This should knock one or two of the alloys off the stage. Jump off of the stage and spike them using your + , then use your other jump and your + to recover. Keep on repeating this. If you get hit, just fall down and use your + when you are below the ledge. If you use you + too early, you will go a bit higher than the ledge before grabbing onto the ledge, and the alloys will most likely use that time to smash you. This page was last edited on 27 August 2013, at 08:51.